Hey all you people who just finished marching this summer! We're running out of Forzato pics! Hurry up and e-mail your best shots from the summer to dave@dci.org along with where and when the photo was taken. Send some biographical information about yourself as well. We'll give you full credit. Also, let us know if you want your e-mail address included. Greg from Ohio sent in a shot of this 1991 souvenir. "I had seen the Velvet Knights about 10 times this summer, and this was my home show (Soaring Sounds). 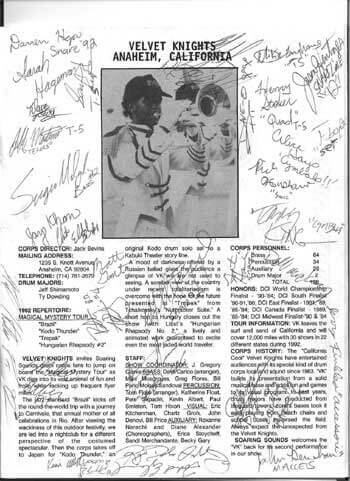 Being 12 and a drum corps nut, I went around and got the "autographs" of the whole percussion section. Actually, a few girls in the guard thought it was cute so they signed too. This is a great item I still have in my collectiopn, along with the video of this show. For anyone who remembers the Velvet Knights, hold those memories dear." Thanks Greg!